I went to Big Lots again yesterday. I was going to buy a new fan heater, but the day was so warm and humid that I decided it could wait a while longer. Since I was there and the Hallowe'en displays were enticing me, I had a look through their latest DVDs so that I could report back about anything good. As you can see (above), I found "Frankenstein: The True Story" (1973) and "Teeth" (2007) for $3 each. A couple of years ago, I bought "Terror of Frankenstein" (1977) in one of the "3 for $3" packs by mistake and was horrified that it was such a boring piece of crap. I really wanted "Frankenstein: The True Story" all along. and now of course, I have it. Although I reviewed "Teeth" a couple of years ago too, I didn't have a copy of it before. I almost bought it from FYE's "sidewalk sale" for the same price, but I'm glad that I saved my money. I'd rather spend my money in Big Lots than FYE anyway after being charged rip-off prices by them in the past. plus I have issues with their current management which goes back to how they were so greedy that they put their entire staff in danger by not closing during a "State of Emergency" three winters ago. Was it worth it to stay open for another four hours with no customers around or to lose a customer who was spending over $200 every week in their store until that time because their greed disgusted him? I think not. I still look in FYE occasionally, but that particular store will never get another penny from me. Thus, there were some bargains and some not-quite-so-good bargains. 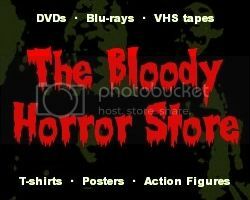 There weren't a lot of newer horror movies, as most were restocks of DVDs which they had before. Some were only the old full screen versions, so you have to be careful. If you have the "Nightmare on Elm Street" 4 film packs for $10 each from Target then the single disc versions aren't really worth having. "Hostel" was overpriced too, since it was previously sold in Big Lots for $3 not very long ago. If you are thinking of buying a lot of these titles and have a Big Lots loyalty card, it might be wise to wait until the next "Friends and Family" night on October 7th, 2012, to save yourself some more money.